5th – 8th Lake Country Conference Track Meet – Monday, April 22nd at Cushing – Events start at 9:00 AM. 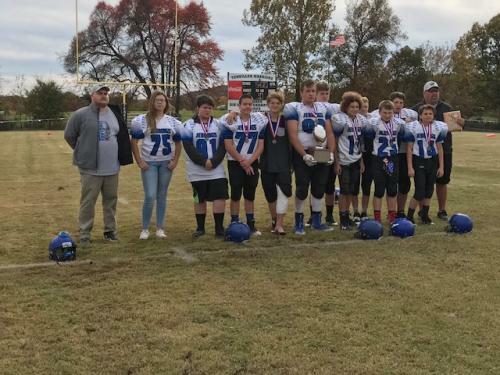 Congratulations to the 7/8 football team. They are 2018 O.R.E.S. Division III State Runner-Ups!!! We are now offering a free tool to report bullying or potential threats anonymously using any device. Click on the following link to access STOPit. The access code is 9187572536. Congratulations to our April Student of the Month and Principal’s Choice Student of the Month winners!!! Gabe Skinner is our Elementary Student of the Month and Calvin Evans is our Middle School Student of the Month. Cameron Thompson & Emma Diem are our Principal’s Choice Students of the Month. Congratulations to Gabe, Calvin, Cameron, & Emma!!! We want to say a special thank you to all of our Community Partners! We couldn’t successfully educate our students without your support! Thank you for everything you do in supporting our school and students! For those of you on Facebook, we have an official Facebook Page for Jennings Public Schools. You can follow us and stay up-to-date with events by clicking on the link above. All offices are located in the cafeteria annex. All other doors will remained locked throughout the day as a safety precaution. ALL VISITORS, including parents, must report to the main offices located in the cafeteria annex before going into any other building. We will continue to use the Remind text service for the 2018-2019 school year to keep parents better informed. Through a service we are able to send important notices and reminders to each parent through text messaging. The service is absolutely free. We will be sending out notices and updates on regular basis. To sign up for the service simply text @jenningspu to 81010. It will then prompt you to reply with your full name. Once that is complete you will start receiving notices from the school. We have a feature for parents and students to keep up with their progress throughout the year. Parents & students have access to grades via the online gradebook. Each student has a unique user id and login that has been provided by the school. You may log in at any time to see the grades. The link is located at the top right hand corner of this page. If you lose your login information or have questions, please contact Mr. Meador. Please visit our Child Find page, if you know of any child, ages 21 and younger, that lives within our district and has special needs, but is not currently being served. Building a sense of family and community while shaping Life-long learners through an Understanding that Education is facilitated through leadership and character. Jennings Public School challenges every student to be creative, problem solvers Adapting to the ever-changing world, Yielding respect and embracing diversity. Successful futures begin here! I am a Jennings Bluejay at Jennings Public Schools. I was born to be a winner, and I will not allow myself to think of failure. I believe there is no limit to what I can achieve. I will determine what I will become.